I picked up a copy of Ella’s pattern for this year’s Wool Week hat when I was at the Edinburgh Yarn Festival (yes, I went all that way for the pattern? well not really, but I was there and it was there so I picked it up), and, I have at last got my hat knitted. It took a while but I found the time on my flight to the US this past week, on my way to start my US adventure. I planned the colours for my hat in my handspun yarn, as usual, changed the colours a little, and used all naturals. What I did change was one of the rounds of crofthooses (sorry Ella). The idea popped into my head that it might be nice to have words in it, so I graphed out ‘shetland wool week croft hoose hat’. It almost fitted the stitches but not quite, so after some thought, I took out ‘week’ and put in ‘toorie’ (Shetland for ‘hat’) and that fitted perfectly. Didnt get it knitted before I left for the US. But it kept me occupied through the flight from Aberdeen to Amsterdam to Atlanta and then to Ashville, NC. A long flight with a few problems but it did get me to my destination - and the hat was done, and my US adventure with my friend Martha Owen had begun. First stop here in the US is the John C Campbell Folk School, NC, where we are teaching 2 classes, a weekend class in Dyeing, which finished this morning, and a week class in dyeing, spinning and knitting which starts tonight. The weekend class went really well, lots of colour, and good students, with some old friends among them. The time just went by too fast. 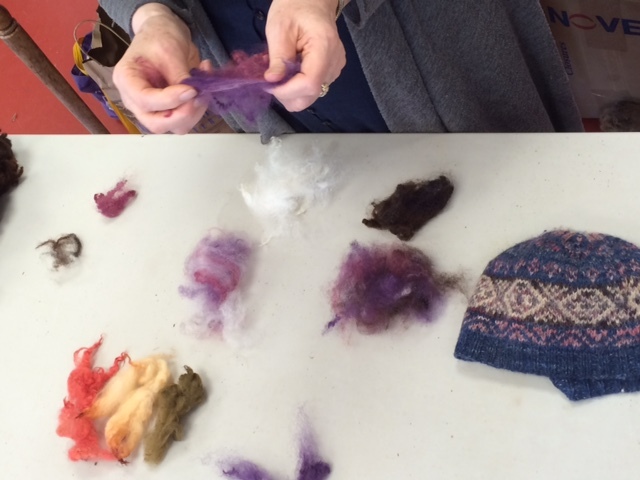 looking at samples of the dyed fleece and mixing the colours. Today has been a long day so far and there is still more to do. It started with Martha and David at Morning Song at the Folk School at 7.45am, then to finish the class, and the student presentation, before a leisurely lunch and a rest (and finding a little time to write a blog) before Martha and I head back to the Folk School to meet the students for the next class and get that one started. But the sun is shining, it is warm with very little wind, and it is so relaxing sitting on the porch among the trees in North Carolina. The US trip will continue with classes at North House, Minnesota; Vesterheim Museum, Iowa; The Trading Post for Fibres, Indiana; then Martha goes home and I continue to Cordova, Alaska; then home.